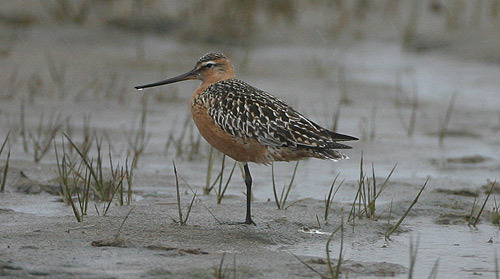 This Bar-tailed Godwit was photographed at Stephenville Crossing on June 5, 2006. 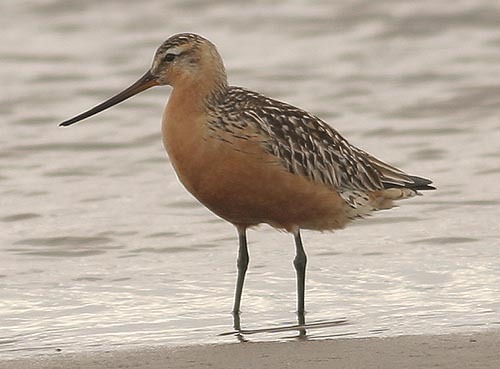 It marked the fourth record for Newfoundland, but was likely the same individual spotted at the same location each of the previous two summers. Origins: Breeds on the Arctic coasts and tundra across Europe (including Iceland) Asia and into Alaska. 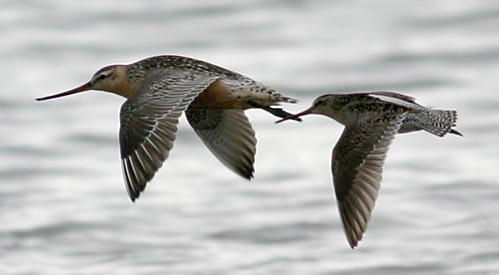 Interestingly, it is credited to make the longest non-stop flight of any bird on a course from Alaska to New Zealand. Record Details: Four records for Newfoundland – the first was in St. John’s from October 26 – November 6, 1973. The other three records, all from Stephenville Crossing (July 22-27 2004, July 12-18 2005, June 5 2006) , are likely of the same individual returning three years in a row. Stephenville Crossing, July 14, 2005 (presumably the same individual from 2006, above). The dark back is characteristic of the baueri ssp from Alaska. Stephenville Crossing, July 14, 2005 (presumably the same individual from 2006, above).